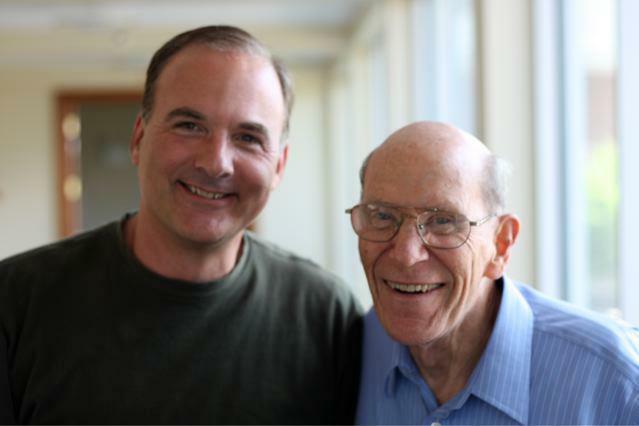 I had the privilege to co-author two books with Jerry Bridges. But our relationship didn’t focus on writing. It focused on prayer. I was one of Jerry’s intimate prayer partners. We would call each other at the drop of a hat whenever there was a need. And since there was always a need, we talked a lot. In the eyes of many, Jerry was a giant of the Christian faith. Yet in his own eyes, he was never more than an undeserving sinner redeemed by Christ. Those who knew him best understood that Jerry’s humility was the key to his greatness. This from a man who wrote the book on personal holiness. This from a man who, in the eyes of all who knew him—including those who observed his life most closely—actually practiced what he preached. What motivated Jerry to live this way? It can be summarized in four words: gratitude for the gospel. It was a lesson about the necessity of living by the gospel instead of by performance. . . . This eventually became a major theme of my ministry, though it took several years for me to develop the integration of living by the gospel and the pursuit of holiness. After The Pursuit of Holiness, Jerry assumed he’d never write another book. Thank God he was wrong! There were many, many more to come. I will touch here on a few. In 1987, Jerry’s first wife, Eleanor, was diagnosed with cancer. Jerry’s Trusting God: Even When Life Hurts was published the folllowing year when she died. It grew out of a personal Bible study he had done on the sovereignty, wisdom, and love of God as he grieved the loss of his wife. It has sold nearly a million copies. If you’ve never read it, don’t wait for the day of your suffering and loss to arrive; read it now to get ready for what’s to come. In 2006, Jerry was vacillating between writing a book on faith or a book on sin. I begged him to write on the latter, since what he’d taught me about God’s holiness and our sin had been so helpful. The result was Respectable Sins: Confronting the Sins We Tolerate. Though a sinner, Jerry didn’t tolerate sin. When he wrote this book he leaned on me to provide a few modern-day illustrations of sin. I co-authored two books with Jerry. The Great Exchange: My Sins for His Righteousness is based on his favorite book outside the Bible, The Apostle’s Doctrine of the Atonement by 19th-century Scottish theologian George Smeaton. Two years later, Crossway released The Bookends of the Christian Life, which answers “How does God accept us?” and “How do we change?” The bookends illustration was the first thing Jerry taught me when he took me under his wing. From it I learned to get off the performance treadmill and live by gratitude for purchased grace. Jerry was always surprised when one of his books sold well. But he’d also be surprised when certain books failed to sell. In his mind, The Gospel for Real Life and The Transforming Power of the Gospel were two of his best. He’d sometimes express a bit of disappointment about their sales report, and then quickly add, “It’s up to the Lord which books sell and which don’t—we can do little, if anything about it.” Jerry was not a self-promoter. At the time of his death, Jerry was working on a book about God’s providence. It’s a theme he emphasized in his memoir and wanted to expand on. A year ago I sat at Jerry’s dining room table, the place he typically did his writing—longhand with pen on paper. Every 10 minutes or so Jerry would put down his pen, close his eyes, and slip into what looked like a catnap. A couple times it looked as if he was going to fall off his chair. Then he’d suddenly awaken, pick up his pen, and start writing away. He’d look at what he wrote, nod his head as if to say, “Thank you, Lord,” and then repeat the process. The result was Jerry’s final book, The Blessing of Humility: Walk within Your Calling, which will be released later this year. If you met Jerry you would soon realize he personified humility as well as anyone. He actually had many reasons for pride. But his was not a false humility; he sincerely didn’t think much of himself. I would like to say his humility rubbed off on me. It hasn’t. But he certainly pointed to the path. He taught me to take my pride to the cross. Jerry would not want us to put him on a pedestal. One time he called from an airport to ask for prayer. He was distraught, and I was confused. He was upset with himself for being anxious at the baggage claim. Yes, he was serious. His anxiety proved he didn’t trust God, and that was sin. And he didn’t tolerate it. I’m no Jerry Bridges, but like so many others, I’m inspired by his example. First he prayed for the people whose home he’d just left. Then for those who heard his message the previous night. Then for those back home in Colorado. Then for our country, and before I knew it he was praying for the world. Jerry’s prayer was nothing like going through the motions or seeking to impress. He later shared his “world map” with me, which he took everywhere he went. It was divided into seven sections and he prayed for a different one each day. He prayed for persons he knew in those regions. And he was able to pray for governments because he took the time to understand their issues. Inspiring, isn’t it? I am an adopted son of God. I am a servant of Christ. I am not yet perfect. By walking through each of these truths with me, Jerry taught me to “stand in the present reality of my justification.” And this alone has changed my life forever. Jerry respected many of the Christian writers of our day, but he really loved the great authors of past centuries. We affectionately referred to them as “The Old Dead Guys.” John Owen was his favorite. The first book he had me read was Owen’s Overcoming Sin and Temptation. If you want to understand what made Jerry Bridges tick, read that book. As Jerry taught me the great doctrines of Scripture, I began seeing the sovereignty of God on every page. One day at lunch I sprang up from my seat, exclaiming, “We need to go to war for [a certain type of] theology.” Jerry looked at me calmly, and gently spoke, “I understand why you feel that way, but it’s the wrong battle.” I sat down. “If that’s not the right battle, what is?” He answered, “The battle for the gospel.” Getting the gospel right meant understanding and rightly applying the truth that Christ died in our place, as our substitute, and that we connect to him by faith alone. I will always remember Jerry for emphasizing two things. First, the transforming power of the gospel. One of his favorite Bible stories was the sinful woman in Luke 7. She anointed Christ’s feet with costly ointment because she was overwhelmed by gratitude for the grace he’d extended her. When we see ourselves as we really are—sinners saved by grace—our hard hearts soften, and we are changed. Motivated by the costly love of Christ, the externals follow—including the spiritual disciplines, sacrificial living, and generosity. These don’t earn us God’s favor; rather, we do them because in Christ we already have his favor. Second, our reliance on a power outside of ourselves. You could call it the power of God, or the power of Christ, but Jerry referred to this as the power of the Holy Spirit. Sanctification is not about digging down and trying harder. It’s about understanding and applying “dependent responsibility”—we’re 100 percent responsible and, at the same time, 100 percent dependent. The power of the Spirit can be synergistic or monergistic. In his later years he thought the monergistic power was the more prevalent of the two in both justification and sanctification. Jerry was a great gift, not only to me but to countless others as well. The problem with great gifts is they leave giant holes when you lose them. No one will ever take his place in my life. So I’m glad to have his books and audio messages to keep me company until I see him again someday in the presence of the all-glorious God-Man, Jesus our Savior, whom Jerry loves because he first loved him.